The city is offering police officers to train as firefighters, but so far there is little interest among officers. It’s been a couple of months now since the city OK’d a new police officers’ contract that pays officers to cross-train as firefighters. Despite the offer to pay for the training and $1,000 extra per year in salary, not a single officer has taken up the offer. Department policy does not allow officers to talk to the media without permission, but one officer did confide with The Review that he doubted anyone would take up the offer. That’s because, he said, there is little support among officers to transition into a public safety-styled department where police officers double as firefighters. The public safety department model has generally not worked well over the years in other metro communities. Highland Park, for example, gave up that concept and went back to having independent police and fire departments. The city administration says it is not committed to turning public safety into one department, but the option is still on the table. The issue of cross-training has sparked a division among city councilmembers. 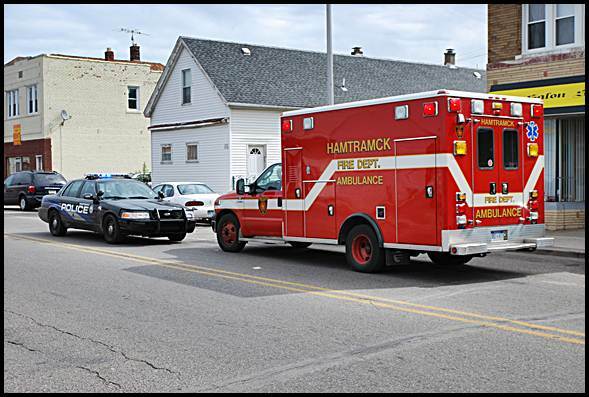 Both Councilmembers Ian Perrotta and Andrea Karpinski are vehemently opposed to the concept, insisting that because of the close proximity of housing Hamtramck needs a fire department staffed with full-timers. Perrotta also said that City Attorney James Allen told the council that he is using the cross-training clause as a bargaining chip – “leverage” — for upcoming contract talks with the firefighters’ union. “The Public Safety Department provision is likely not a strategy to get a better deal but more likely the endgame.” Perrotta said in a recent statement. A public safety department isn’t the only option the city administration could seek. 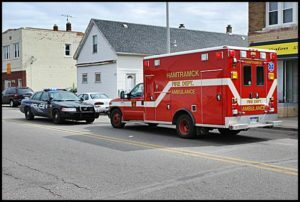 There is a possibility for Hamtramck to contract out firefighting services to Detroit – as long as Hamtramck firefighters would have an opportunity to transfer to that department. One other option being explored is forming a fire authority with an existing one or starting a new partnership with other communities. This would result in an added fee to property owners, and the concept would have to be approved by voters in all affected communities. The firefighters have another two years on their contract. The reason why there is focus on the fire department – and for that matter the police department as well – is that the city is facing a budget shortfall. Now, with GM likely closing down the Poletown Plant, that will blow a bigger hole in the city’s budget. The city collects about $800,000 a year from the plant in lieu of taxes. If the plant closes, city officials say that revenue stream will dry up because it’s also based on the amount of production at the plant. In the meantime, City Manager Angerer said her staff is working on a budget for the upcoming fiscal year, which starts in July, that will include a number of cuts. But there is little fat in the city’s budget, and Angerer said she will be meeting with the city council to discuss what other options are available.